Hard Case Crime; New York (Dorchester Publishing Co.: 2009), originally published 1951. Bison Frontiers of the Imagination; Lincoln, Nebraska (Bison Books: 2011), translated and edited by Peter Shulman. Two authors, quite unalike. Two time periods, very different. Two portraits of Budapest written 50 years apart. Jules Verne is probably familiar to you. If not, gargling the Internet will result in virtual reams of information. Let’s begin with the more recent author, Robert B. Parker. This isn’t Robert Brown Parker, who wrote a series of private eye novels about a character named Spenser and a few westerns, one of which -- Appaloosa -- was the basis of a 2008 motion picture. No, I’m talking about Robert Bogardus Parker, a World War 2-era newspaper correspondent and undercover OSS operative. He is the author of Passport to Peril, a post-war thriller republished in 2009 by Hard Case Crime. My favorite Hard Case Crime publications are its “rediscovered pulp classics.” There is a vigor in the prose of these novels that makes them fresh and entertaining. Although their settings are 50 or 60 yeas past, they don’t feel dated, but as though they were only recently minted. Another of these HCC discoveries I rank highly is David Dodge’s Plunder of the Sun. 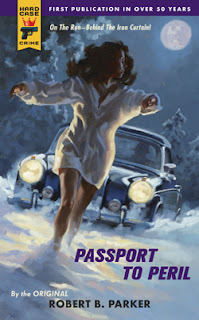 The hero of Passport to Peril is John Stodder, an American traveling to Hungary. Like many of the heroes in Hitchcock films, Stodder is an innocent caught up in evil events by seeming coincidence. But Stodder isn’t quite so innocent. We learn at the end of Chapter One that he is traveling under a fake name, using a Swiss passport made out to Marcel Blaye. In that same chapter, we learn that Blaye is a real person, and he has been murdered. Parker tilts the reader’s expectations right off the bat, by introducing doubt about the novel’s narrator, Stodder. Did he kill Blaye? Why is he traveling under a dead man’s passport? And why is Stodder suddenly so desperate to escape the men stalking the woman with whom he is sharing a train compartment? These elements tip the narrative off the platform of the train car and get the plot rolling. And it rolls fast. The pacing whips along, with Parker introducing a variety of colorful and deadly characters. Spies, doublecrosses, underground Nazis, and devilish Soviet agents and Mata Haris. Parker does a great job rollicking his characters along in post-war, Soviet-occupied Budapest, which might be said to act as a character itself, much in the way the city of Ed McBain’s 87th Precinct novels is more than just a setting for the action. Stodder frequently compares the dreary, blasted Budapest to the city and its sights he knew before the war. In the 1980s, Verne’s original manuscripts were made public, and the extent of Michel’s fiddling in the posthumously published books was made very apparent. The 2011 Bison Books edition is the first authentic English translation that has been made available. Henry Vidal, the narrator of Storitz, travels to Ragz, a fictional Hungarian town, to visit his brother and attend his wedding. So, like Parker’s Stodder, Vidal is a traveler. He leaves Paris by train to Vienna, where he boards a steamship to travel the Danube all the way to Ragz. Verne offers “a leisurely, descriptive ‘travelogue’ of Henry’s trip down the Danube. Such travelogues are inserted into many of his books, even though they might not have anything to do with the actual plot or narratives. According to Verne scholar Terry Harpold, they are like musical interludes in a Bollywood film.” (203) This interlude is particularly valuable to readers who want a good picture of the place at period -- a description that might only be surpassed if the reader were to get his hands on a contemporary edition of a Baedeker for the region. Vidal devotes several passages to his explorations of Budapest. This is a colorful, vivacious city that demonstrates a dynamic and vigorous culture. This portrait is far different from the picture drawn by Parker’s narrator, Stodder. As Stodder’s adventures are made more dangerous by covert Nazis and Soviet agents, Vidal’s voyage is haunted by a rude, ominous German. In time, Vidal learns this stranger is the Wilhelm Storitz of the work’s title -- a mysterious, brooding and dangerous man whose romantic advances toward Vidal’s future sister-in-law were rejected. Storitz had afterward voiced serious threats against the engaged bride and groom. After Vidal’s arrival in Ragz, a number of inexplicable events beset the wedding couple and their families. For example, an engagement party in the bride’s home is invaded and ruined by an apparent ghost. Eventually Storitz is revealed to be at the center of these attacks. He remains at large and a threat to the community’s happiness, for like H.G. Wells’ Griffin, Storitz has obtained a concoction that renders him invisible. The psychological terror Storitz renders the wedding couple is in many ways greater than the physical damage he threatens. In both Parker’s novel and Verne’s, evil is introduced by the presence of unwelcome foreigners: Germans and Russians for Stodder; the German Storitz for Vidal. Ragz, though an artificial creation by Verne, is presented as a cheery, energetic community, similar to the Budapest visited by Vidal. But the entrance of Storitz’s threats and terrors causes an atmosphere of dread to settle over Ragz -- not so different from the scenes in Budapest described in Passport to Peril by Parker. Originally appeared in Adenture magazine December 20, 1922. Available for free download from PulpGen. 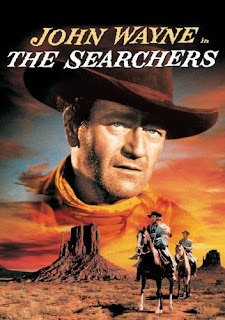 Alan LeMay is probably best known these days as the author of The Searchers, basis for the remarkable John Ford film starring John Wayne and Jeffrey Hunter. Another fine film was based on the novel, The Unforgiven, directed by John Huston and starring Burt Lancaster and Audrey Hepburn. LeMay's work also showed up as the basis for a number of TV series episodes over the years. LeMay's strong association with the western genre makes it surprising that he wrote outside the western field. An interesting example is "Ghost Lanterns," which appeared in Adventure magazine in 1922. This is a nautical tale. Not surprisingly, it's climax turns on a twist ending in the O. Henry mode. The story focuses on the seven men on a schooner becalmed for three days off the coast of Brazil, out of sight of land. Men from the crew start disappearing at night. There is no sign of what happens to them, and no one is awakened by any sounds of struggle -- the men are just discovered as gone the next morning. There is some nice build-up of tension in the course of this short story to reinforce the strangeness of the disappearances. Overall, though, the tale isn't particularly memorable, but it is well-written. Of interest, however, are the glimpses of LeMay's eventual mastery of storytelling. He is particularly adept at describing his characters. For example . . .
Of the seven of us Cap Dorkin was the hardest boiled. He was a short, square-built man of indeterminate age, with the fishy kind of eyes that show the whites below the irises. This is a brief tale that's diverting and provides some entertainment, and it offers a nice flavor of the mid-range type of tale that would fill in an issue of Adventure between the top-rank serials and longer stories by the high-profile authors, such as Talbot Mundy, Harold Lamb, and similar folk.